Canning is a method of food preservation that has been around for nearly 400 years. In recent years, more and more people are canning fruit, jams, jellies, meats, and more. For many, canning has been an at-home tradition and is a way of life. For others, taking on canning can be a daunting task. Here’s a list of four essential items for first time canners and as a good reminder for the well-seasoned canner. 1. What to Can – If you are canning fruit, buy it when it is ripe. Under ripe or overripe fruit can ruin an entire stock of canning. 2. Canning Equipment – You will need jars, rings, and lids. We would recommend using wide-mouthed mason jars to help keep things a bit cleaner. You can reuse jars and rings, but not lids. When reusing the jars, be sure and sterilize them before canning. You will also need a pot large enough to fit 5-7 jars at a time as well as a rack of some kind to keep the jars off the bottom of the pot. Depending on what you are canning; a funnel, tongs, and a magnet stick will help. 3. Inside or Outside – Traditionally, canning has been a process done inside, which heats up your house and can quickly make a mess of your kitchen. 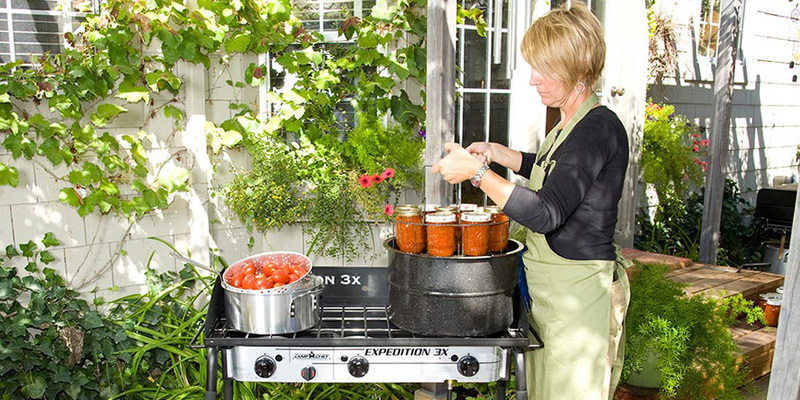 Canning outside can be cooler and if you make a mess, it is outside your home. 4. Recipes – There are hundreds of recipes out there for canning all sorts of foods. Some of the best tend to be those passed down from generation to generation. If you don’t have access to those, we suggest checking out this recipe for jam or doing a web search for home canning recipes. If you are a first time canner please do not use some other Family’s favorite recipe, and not one from the internet. For safety use a tested recipe from a University Extension service, USDA web site or a BALL BLUE BOOK for canning 1988 or newer. Follow the directions to the letter and do not change the recipe or add more or less of anything. This way you will have save and fun experience with your canning. Now I have Tomatoes to pressure can!